The low residency last month was a wonderfully enriching experience in a number of ways, and prepared me for moving forward in my project contextually and practically. Meeting everyone in person felt very seamless, and I think it is a strength of the course format that after having only communicated online to that point, as a group we are close in being knowledgable of the rhythms of each of our concerns and processes. I felt this strongly in the group tutorial session on day 2. Our group was led by the MA Designer Maker course leader Maiko Tsutsumi, and I shared my work with Michelle, Chris, Lyu, and Omer (IG @omerder) from the Designer Maker course, who showed us around his ‘work in progress’ show installation - something which I think we were all very grateful for. There is a tenderness to Omer’s use of materials in his sculptural work - an echo of the inner subjects which reveal themselves on closer inspection - relationships between gender, place and expectation, identity and geological activity. 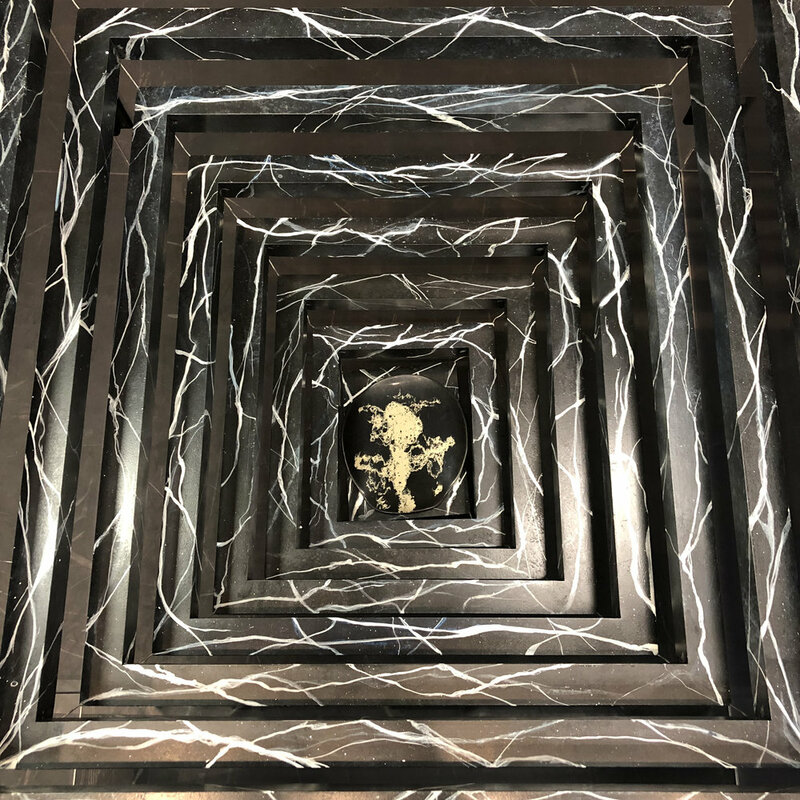 I found the installation cohesive and the work itself seductive, and this has since made me pause to think more about exhibition and presentation of my project and how that might work. The gallery visits, tutorials and workshops on 3D printing and Virtual Reality work, have pushed those considerations forward as discussed within my Mid-Point Review material and evaluation in my last blog post. Gillian and George in the 3D workshop guided me through the practical refinement of the extruded model from my primary school achievement binder scans I’d been struggling with in Fusion, and printed a sample of the model for me which demonstrated how the properties of what I had produced in Fusion would result in a brittle, spiky surface. Part way through the print, the sample looked much closer to what I had hoped for, with a more ‘readable’ topography than the finished piece in which the detail had been pulled out from the base of the mesh to such an extent that it resembled more of a forest, which I felt overshadowed the subject and lost clarity. George shared an alternative method of producing height maps in Blender which seemed much more appropriate than Fusion - much faster and easier to configure, and more intuitive to me, and he explained to me how I could use a plane to cut through and achieve a surface that did not taper into the tall spines that the original produced. 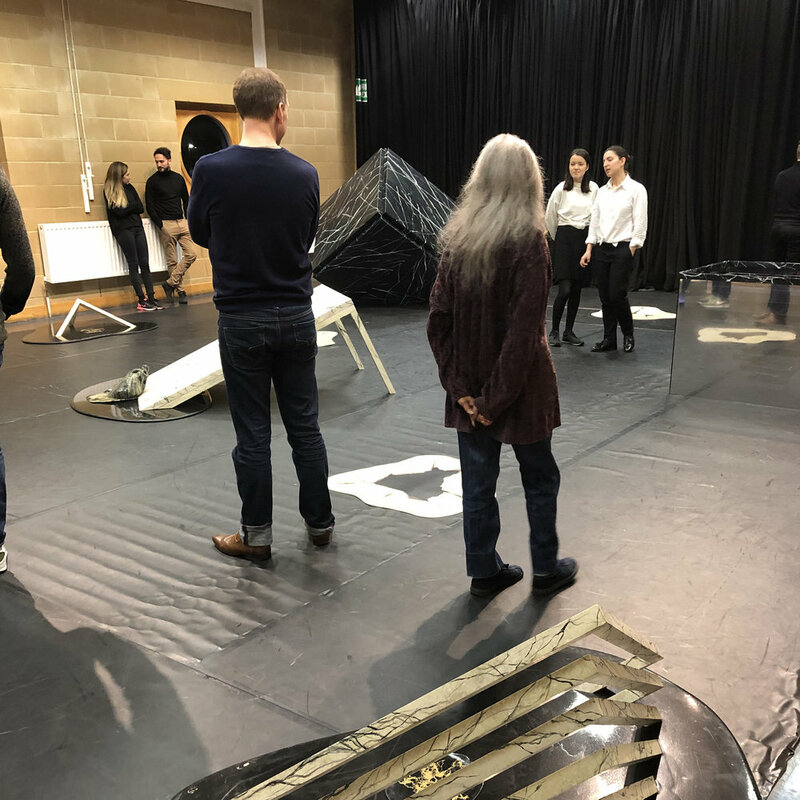 Our visit to areByte gallery fed into the VR workshop I attended, led by Fine Art Digital alumni Alejandro Escobar, and both experiences were thoroughly constructive and informative. Alejandro showed us how to animate scenes and export as 360 video in Blender, as well as explaining the context of contemporary VR work in art-making, and an introduction to the vast array of technical considerations or variables that related processes involve. Both the workshop and the ‘RE-FIGURE-GROUND’ show at areByte were incredibly engaging, (I found Lorna Mills animated GIF work and Eva Papamargariti’s sequencing of CGI, text components and live-action film especially compelling) and, building on the tutorials I had with Gillian and George, the week coalesced to a great learning experience in which the vitality of the media and processes at the base of interdisciplinary VR, CGI, simulation, and print gripped my attention and gave me many ideas. These have informed the second version of my Project Proposal. Yellowhirlaway, Lorna Mills. 4-channel GIF animation, 2017. Thanks to Danni (thank you again!) 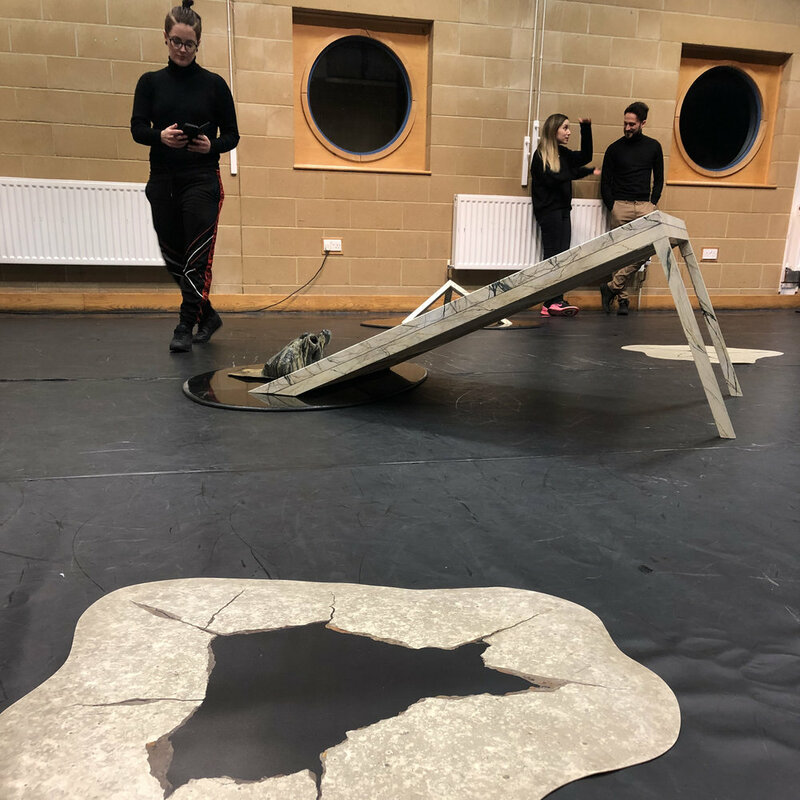 I had the opportunity to attend a performance of WHIST at the Watermans Arts Centre, which again was so motivating and tied into the same considerations and concerns. One of the most immediately clear benefits of attending Alejandro’s workshop was to be able to interpret and analyse WHIST in the context of it’s design and also functionality as a VR piece, and to be able to apply questioning which has begun to inform ideas for ways forward in my own project. The problems I experienced with the object identification element (the Augmented Reality component) during the performance hindered the immersive continuity of the narrative, and this, while being maybe my only substantial criticism of the piece, which was otherwise wildly compelling and pretty much unlike anything I’ve experienced before, did make me think about applying focus and a thorough process to ideas that might run the risk of being interpreted as over-reaching or unintentionally disparate. This specifically is something which I try to be mindful of as I map out what I referred to as the kind of ‘borderless geography’ of the narrative I’m developing. Certain pieces in the areByte exhibition also highlighted the technology not ‘being quite there yet’ in different ways - a few of us actually hit the gallery wall in the corner where Claudia Hart’s VR stage piece was shown as we attempted to physically navigate her maze of capitalist symbolism wearing the headset, and the joystick seemed to over-complicate the accessibility of the piece. Alejandro’s workshop generated a lot of very valuable questioning and discussion on issues from health and safety considerations to simply utilising the technology you have to it’s most effective potential rather than pushing for something that weakens an idea. I intend to begin forming sequences of animated scenes to work into larger pieces, and the experiences of the low residency week will certainly help guide me in making informed practical decisions.